The First Geneva Convention is about the sick and wounded members of armed forces. It was signed in 1864. The first Hague convetion, of 1899 defined some of the now generally accepted rules of war. The Laws of war are some simple rules or international law which most people accept about fighting out of humanitarianism. Many people think that because there is fighting, there should be no rules. This is called "total war". However, laws of war have been made so that wars do not get worse than they need to be. Anything marked as a hospital, an ambulance, a doctor, or a first aid person are not to be attacked. Those places, vehicles, and people should not have weapons. Anyone who is a member of a neutral power is not to be a target of violence unless the said person is committing or intending to commit a hostile act. Anyone fighting in the war has to wear a uniform. They can only wear the uniform of their side. Also they have to carry their weapons out in the open where they can be seen. Anyone carrying or waving a plain white flag or piece of cloth must not be attacked. That person should also not attack anyone. They may want to surrender, or just talk about ways to solve the problem without more fighting. Any enemy soldier captured must be treated fairly as a prisoner of war. Religious buildings such as churches, mosques, and temples are to be protected at all costs. Occupied territory should be governed fairly and not looted or devastated. 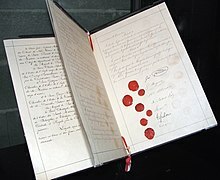 The St. Petersburg Declaration of 1868. It bans ammunition of less that 400 grams weight. It also bans ammunition with Fulminates in them, or with inflammable substances. Through this convention, it is no longer allowed to use ammunition that falls apart into fragments, that burns, or explodes for small arms. Such ammunition can still be used in autocannon or artillery though. This page was last changed on 31 May 2018, at 06:43.